The Grand Canyon is one of the Seven Natural Wonders of the World, so it is a definite must see for everyone. I lived for six years in the same state (Arizona) and never got around to going. I didn’t have a good excuse and the situation needed to be corrected. 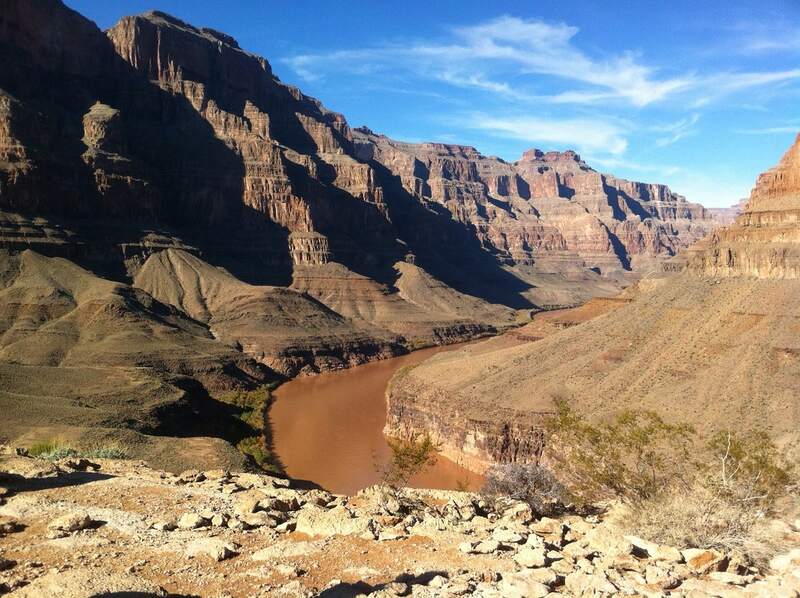 So a few years ago, when I was in Las Vegas, I wanted to do a Grand Canyon day tour. I ended up booking a Grand Canyon helicopter tour from Las Vegas. It was worth every penny! 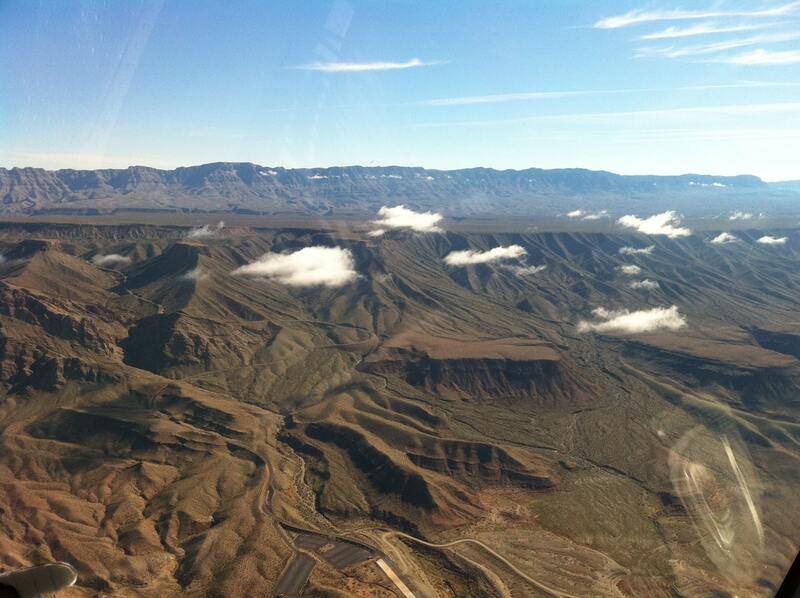 Granted a helicopter tour is not cheap, but I think it is the best way to do the Las Vegas to Grand Canyon trip. You don’t waste time in transit as the helicopter flight is short and very scenic. There are numerous helicopter tour options available from Las Vegas. Some are day trips and include hiking or white water rafting. We decided to opt for the half-day tour that included a champagne picnic lunch in the canyon. There are several companies that offer this kind of tour, we chose All Las Vegas Tours and enjoyed it. The helicopter is air conditioned, so you can do the tour year round. If you have more time, you may want to consider doing a Grand Canyon road trip. Finally Made it to the Grand Canyon! The tour included complimentary limo pickup from our hotel to go to the small airport at the end of the strip. After a brief safety spiel, we put on our helmets and boarded the helicopter. Not every seat on the helicopter is a window seat. They told us that some people would have windows on the way there and others would have windows on the way back. Somehow we were able to work it out so we had window seats both ways. If forced to choose, I would ask which way you will be flying by the Strip and choose the window for that leg. Although I have flown in many aircraft of varying sizes, this was my first helicopter ride, so I was a little nervous. I worried it would be a rough and bumpy ride, but it was actually pretty smooth. When the pilot would turn the helicopter, it was a little scary looking down but the beautiful view made you forget that. Going from Las Vegas to the Grand Canyon, we flew over Lake Mead and the Hoover Dam. 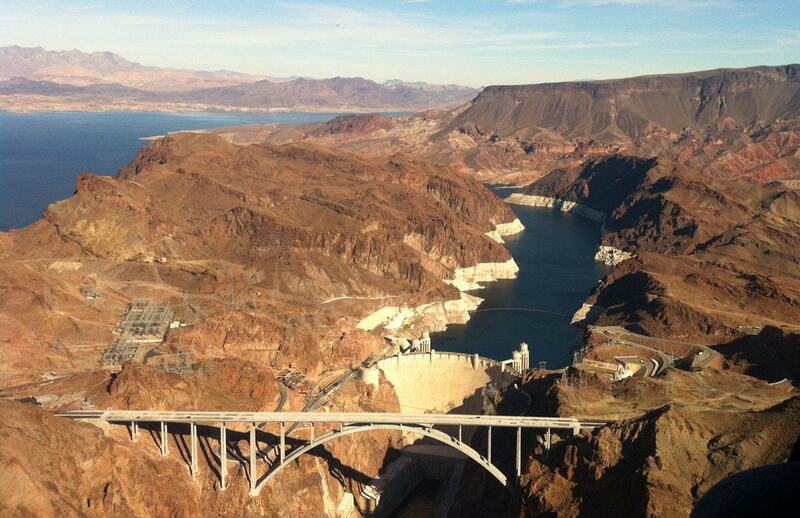 The Hoover Dam is impressive and definitely worth a visit (it’s only 30 miles southeast of Las Vegas). It was built during the Great Depression and is considered one of America’s Seven Modern Civil Engineering Wonders. I did the tour the first time I went to Vegas (before I was 21). You will also see Mike O’Callaghan–Pat Tillman Memorial Bridge, completed in 2010 to ease the traffic crossing the dam. After passing the Hoover Dam, we quickly approached the Grand Canyon. It is awe-inspiring and worthy of being one of the Seven Wonders. The landing was very smooth and we got out to walk around a bit. We didn’t have much time so we couldn’t wander off too far. We took a few pictures and just took in the view. Then it was time for our champagne picnic lunch. The food was not memorable but you come here for the atmosphere! Then it was time to board the helicopter to head back from the Grand Canyon to Las Vegas. On the way back, we flew along the Strip, which is impressive in its own right. When we flew it was the afternoon, I can only imagine how impressive it would have been at night. Then we landed and were taken back to our hotel. 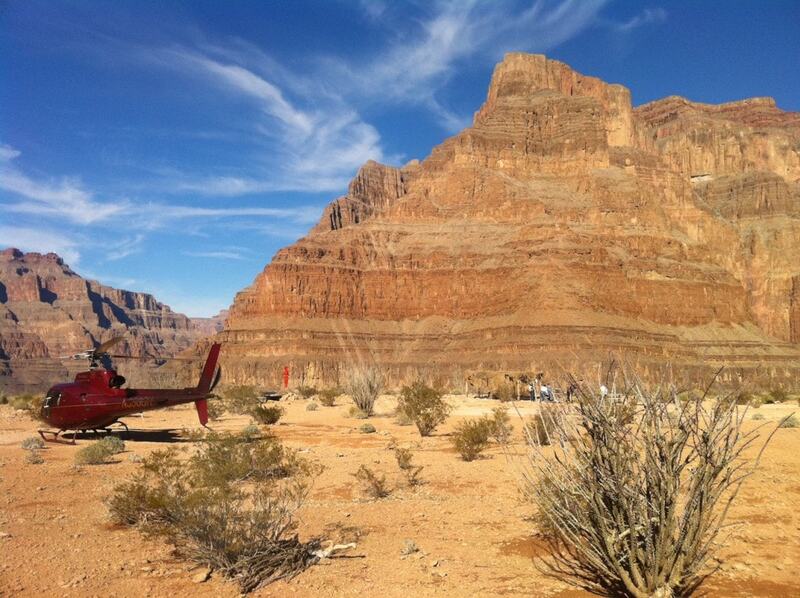 A helicopter tour of the Grand Canyon should be on everyone’s bucket list. It may not be cheap but it is something you will remember for the rest of your life. I think it’s the best way to do a Grand Canyon day trip from Vegas. I thoroughly enjoyed the experience and feel like it was worth the money that I spent. There are all kinds of Grand Canyon tour packages from Las Vegas available through GetYourGuide, so I’m sure you can find one that is right for you. We were looking for something romantic so we chose a helicopter tour with Champagne picnic. If you are looking for something more adventurous, maybe try a helicopter tour of the Grand Canyon that includes white-water rafting. I would just make sure that you choose a Grand Canyon helicopter tour with a landing so that you get the chance to walk around and see the canyon from the floor. If you are on a tight budget, you could do a Grand Canyon bus tour instead. Click here to view the options, prices, and availability. The Grand Canyon is amazing and I do want to go back. A half day Grand Canyon tour is not enough! There is so much to do there. I would love to do some hiking or even white water rafting. I would also like to visit the Skywalk. The Skywalk is a transparent horseshoe-shaped bridge that extends over the edge of the canyon. You can walk on it and look down into the Grand Canyon, definitely not for those afraid of heights. For those of you that are daredevils, there is now a zip line over the Grand Canyon, which is only a mile away from the Skywalk. The Grand Canyon Zipline is nearly 1,000 feet above the floor of a side canyon! There are two separate runs covering 3,500 feet and you can reach speeds of up to 50 mph. I think that may be a bit too far outside my comfort zone. I would also love to do the Havasu Falls hike. The pictures on Instagram just look amazing. The full hike is 25 miles roundtrip and takes two days. Plus, you have to get a permit – for more information check out this complete guide to hiking Havasu Falls. We loved our Grand Canyon trip from Vegas. Someday I will return and complete the rest of my Grand Canyon to-do list. Have you been to the Grand Canyon? Would love to hear about your experience in the comments. Although it can be expensive, a helicopter ride is a great way to see the Grand Canyon. If you have to choose a leg to sit by the window, choose the leg flying by the Strip. If you have time, you should also visit the Hoover Dam. Check out these other ideas and tips for planning your trip to Las Vegas. I had no idea they had helicopter rides to the GC. What an amazing experience. Would you mind sharing how much it costs? I’m so curious. Crystal – Thanks. It really is a once in a lifetime experience! I did this six years ago so can’t remember for sure but think it was close to $300 per person. There are different options that can be more or less expensive. Yes its definitely a very special experience so I felt ok splurging! The Grand Canyon is so high on my bucket list! The helicopter ride is good to know – it’s the kind of thing that I’d be too cheap for, but if I have a good recommendation I might just splurge! Thanks Jamie. I can be cheap a lot of times too but I do think this one is worth the splurge. This looks awesome! I hope that at some point I can afford something like this. Maydi – Thanks it really is a once in a lifetime experience. I hope you get to do it too! Bucket list item for sure! What an amazing experience. Riley – It was amazing and something I will always remember, definitely worth the splurge! That is an option that I would consider! Thanks for the info. Awesome photos too! Fabi – Thank you. I would definitely recommend it if you can. You will not regret it.